2016 is over, 2017 is already fully in swing. I suppose at this point I should give a review of 2016. Here’s my review: #2016. Enough said, I think. Let’s just say I tend to do a lot of drawing when things in the news stress me out! And there really were a lot of celebrity deaths. To those who say, it’s statistically the same as every other year, I say “cor, you are well clever you are”. David Bowie alone was enough. You know the rest of the list; I mean even Manuel from Fawlty Towers died. It’s ridiculous. On top of that, I’ve personally known several people who passed away this year too, including my uncle, two professors from work, and of course my friend and fellow urban sketcher, Florian Afflerbach. He is greatly missed by our urban sketching community. So, as I do every year now, above is the list of sketches I have done this year. It doesn’t include badges designed for my son’s soccer teams, nor the advent calendar I drew, and other side-projects here and there, so yes this isn’t even all of my drawing but this is what I filled my sketchbooks with. 2016 was very much #2016. But personally, it’s actually been a good and very productive year. This was the year I turned 40, which was celebrated with a trip to New York with my friends from London. And I wrote a book! “Five-Minute Sketching People“, a book about, well, it speaks for itself. My second in a year, though this was the first written solely by me (as opposed to being the primary author, as last year’s book “Creative Sketching Workshop” was). It was a lot of work, a lot of late nights at my writing desk, but I’m proud of how it turned out and it’s going into a second printing. My first book has been translated into French as well, so that was exciting to learn. 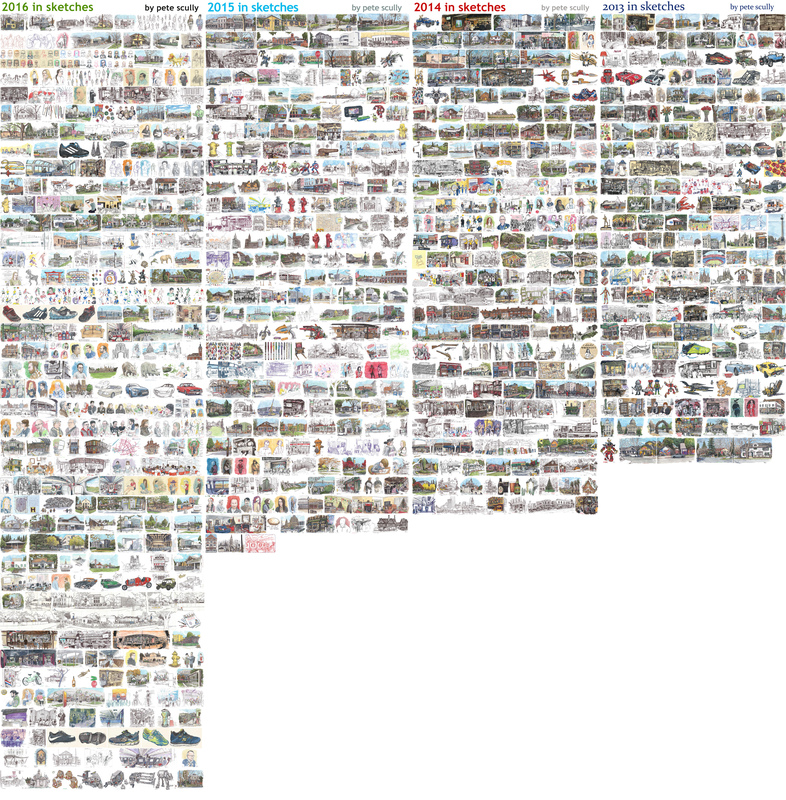 …and I drew a lot of people, because y’know, the book. Also the Manchester Urban Sketching Symposium, there were like 500 people there. I went on eleven plane journeys, and one long 11-hour train journey down California, as well as two much quicker train journeys to Manchester and back. I had a big exhibit at the UC Davis Design Museum called “Conversations of the City”, a retrospective of ten years’ worth of my sketchbooks, which was a great success. I also held a smaller exhibit at the Putah Creek Winery in October. 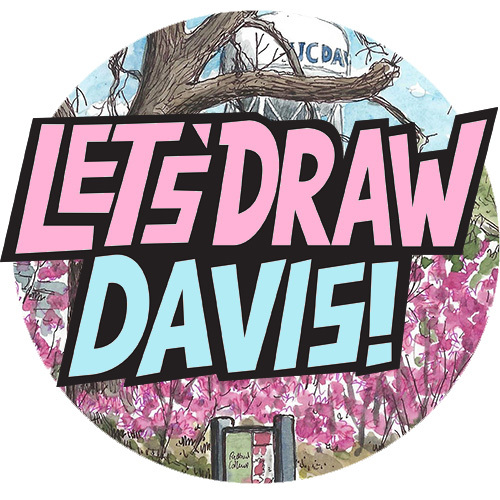 I organized a few Davis sketchcrawls (though not December – I need to put the dates in for this year), but also organized a large Wren-themed sketchcrawl in London which was a big success and great fun. Incidentally, if you’re interested, here are the sketches from 2015, 2014, 2013 and 2012. Yes, I did sketch even more this year than usual, and here is the proof: 2016 compared with the past few years. And 2017 is well under way. I sincerely hope you, and all of us in general, have a good year.And even if you don’t, just get your sketchbook out and do a lot of sketching! These collages are amazing! You can see at a glance that you are drawing more and more each year. Congrats on another year full of wonderful sketches and Legos! And I thought I was busy. I tried to “enlarge” the previous years but couldn’t. So I’ll assume they are as good as this years. Great work. Thanks for sharing. I’ve added the link to the image now so people can enlarge it (WordPress used to do that automatically when posting images, but not now). Cheers! Hope you keep on sketching forever and with more power and zeal every year. Thank you! I certainly hope to be sketching forever. Great summary Pete. You had a very successful year. Good to see you in Manchester.